Who needs the NYS Boater Education Course? All boaters born on or after May 1st, 1996 are required to successfully complete an approved boater education course in order to operate a motorboat. Education is mandatory for all personal watercraft (PWC) operators. 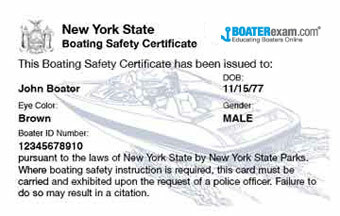 All personal watercraft operators must successfully complete an approved boating safety course before they can operate a PWC on any waters of New York. All PWC operators must be a minimum of 14 years old - no one under the age of 14 may operate a PWC. Not able to operate a boat alone. Students must be at least 10 years to take a boating safety course. The commissioner, by rule or regulation, may provide the exemption of additional persons not listed in this paragraph from the requirements of this section. Persons born before May 1, 1996 may operate without restriction. Take your Boater Exam and be certified for life! From laptop to mobile phone to tablet, choose when and where to take your boating course and get your New York Boating Card. We found out a long time ago that people learn best when they can see what they're learning. Shouldn't you be tested the same way? 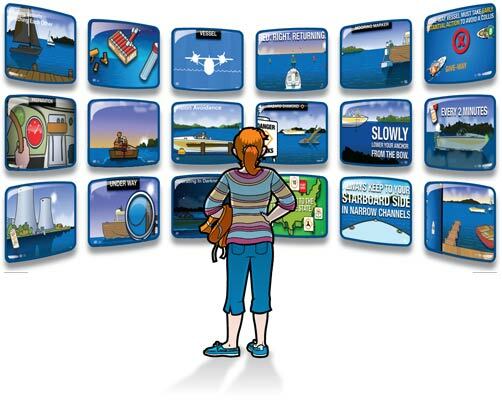 Every one of our exam questions is illustrated to help you get your boating licence. Try our practice quiz now! 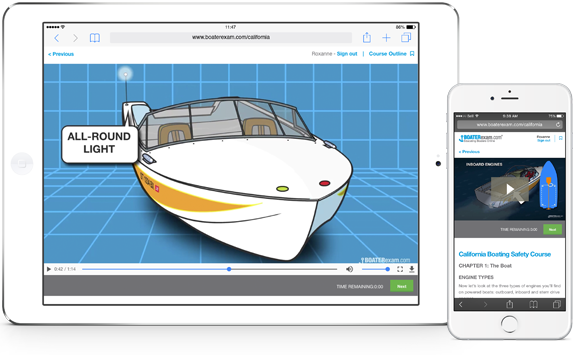 Our New York boating course features hundreds of rich engaging boating videos and animations. That means you aren't just reading: You're watching, listening and learning. BOATERexam.com® is trusted by agencies across the United States to deliver the best of quality in boating safety education. Our courses consistently receive the highest level of approval from agencies and from boaters. This official New York boating safety course is approved by New York State Parks, Recreation and Historic Preservation. We've helped over 2 million people get certified online. So we know what it takes. Think of us as a coach who you can call or email if you ever need help. Available when you need us!